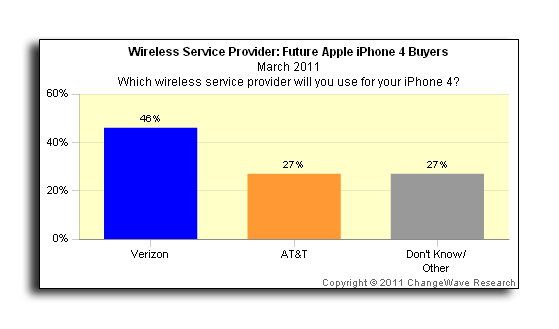 ChangeWave on Tuesday released the results of its latest survey, comparing AT&T iPhone 4 owners and Verizon iPhone 4 owners. 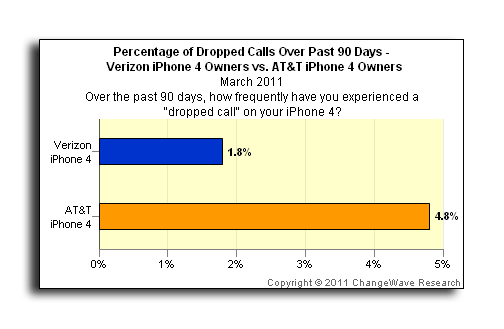 The 4,068 respondents showed that 4.8 percent of AT&T iPhone 4 owners experienced a dropped call on their handset over the past 90 days, compared with 1.8 percent of Verizon subscribers. Those results are similar to an industry-wide, non-iPhone-specific poll conducted separately by ChangeWave. In that poll, 4.6 percent of AT&T subscribers reported dropped calls, compared with 1.4 percent of Verizon customers. Also surveyed were prospective future iPhone 4 buyers, most of which indicated they are likely to buy the handset on Verizon's network While 46 percent of respondents said they are likely to choose Verizon, 27 percent said they would sign with AT&T. A significant number of those polled —27 percent —said they are unsure or did not choose AT&T or Verizon. "Verizon is still in the very early stages of its iPhone 4 offering to consumers," ChangeWave said, noting that the CDMA iPhone 4 just launched in February "It remains to be seen how well the Verizon network performs as the number of Verizon iPhone 4 owners ramps up and inevitably puts more pressure on their system." 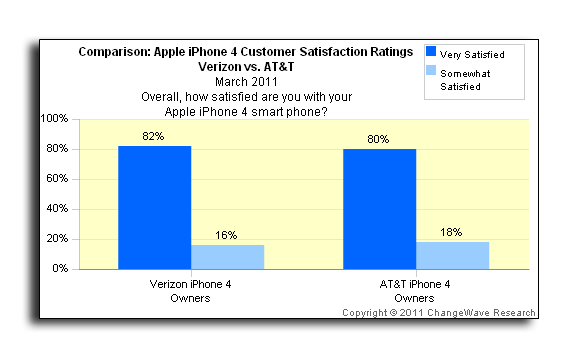 Finally, the survey also asked customers about their satisfaction with the iPhone 4, and the results showed near-identical happiness on the part of both Verizon and AT&T customers. Verizon customers were slightly more satisfied, with 82 percent choosing "very satisfied," compared to 80 percent of AT&T iPhone 4 users. And 16 percent of Verizon customers identified themselves as "somewhat satisfied," while 18 percent of AT&T customers were of the same opinion. That means that 98 percent of both AT&T and Verizon iPhone 4 users consider themselves "satisfied" at some level with their handset. ChangeWave's polls have consistently found for years that iPhone customers are extremely satisfied with the device. Apple's numbers far exceed those of competitors including HTC, Motorola and Samsung.